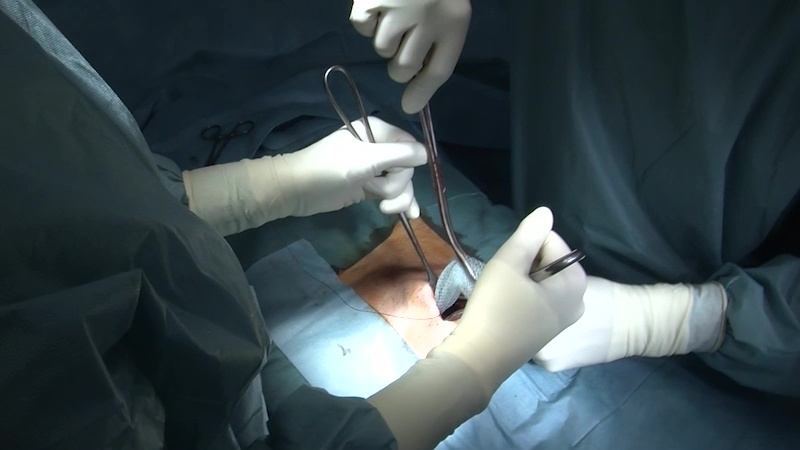 The operation starts in mini-open technique with a 2 to 6 cm long skin incision directly over the centre of the largest hernia defect, followed by exposure of the hernia sac. 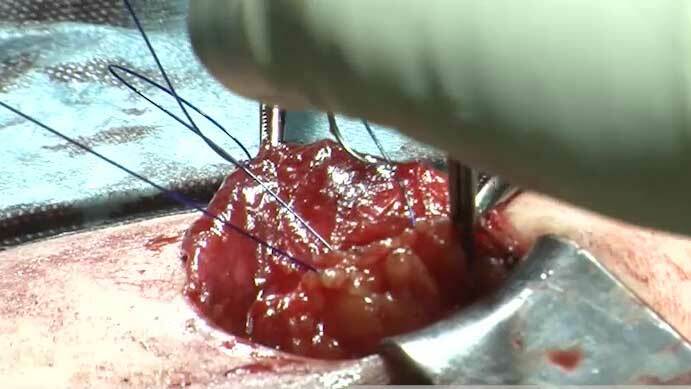 If necessary, the incision is widened for large incisional hernias. Minimal opening of the hernia sac to probe the abdominal cavity is advisable. If necessary, this is followed by open or laparoscopic adhesiolysis. The (primary) hernia defect is carefully exposed by lifting the abdominal wall with slim hooks of various lengths. 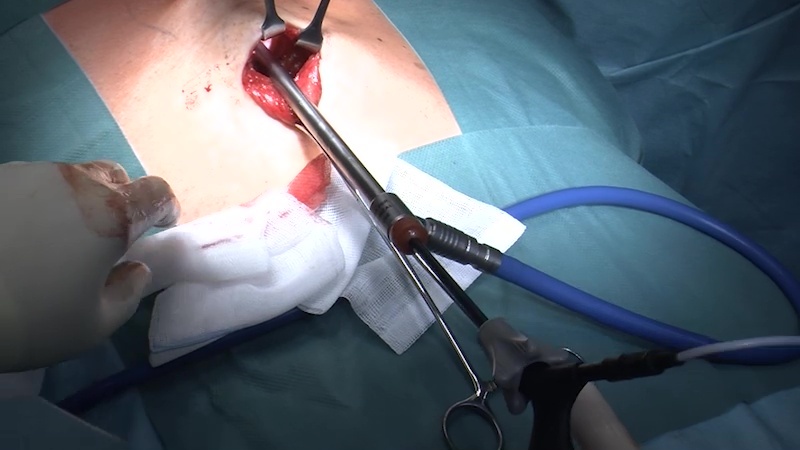 After grasping the hernia defect with sharp clamps, the peritoneum is freed up around the hernia defect and abdominal wall, at first over a radius of 2 cm. A longitudinal incision is applied to the posterior layer of the rectus sheath in all four quadrants, about 1 cm lateral to the medial border of the rectus muscle corresponding to the size of the intended plastic mesh. Using long slim hooks and under endoscopic monitoring, the posterior layer of the rectus sheath is freed from the rectus muscle with laparoscopic instruments. An endoscopically assisted dissection is performed along the midline in the preperitoneal plane: The peritoneum is freed up from the linea alba. 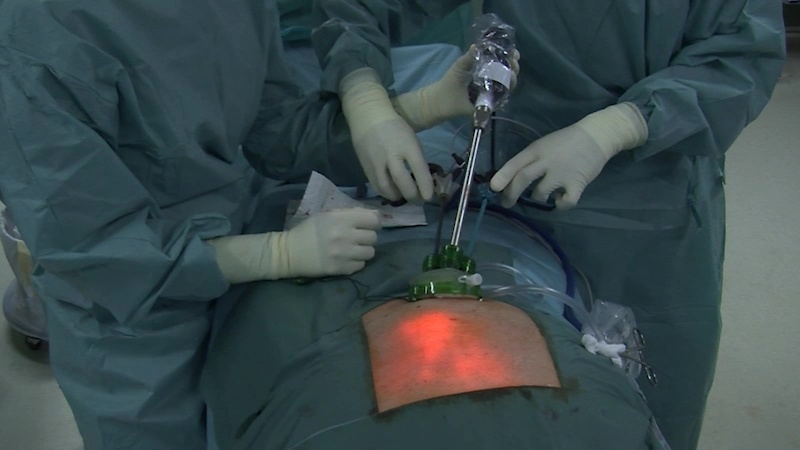 The further totally extraperitoneal dissection is performed through the hernia, either under direct vision with laparoscopic instruments or with endoscopic assistance. 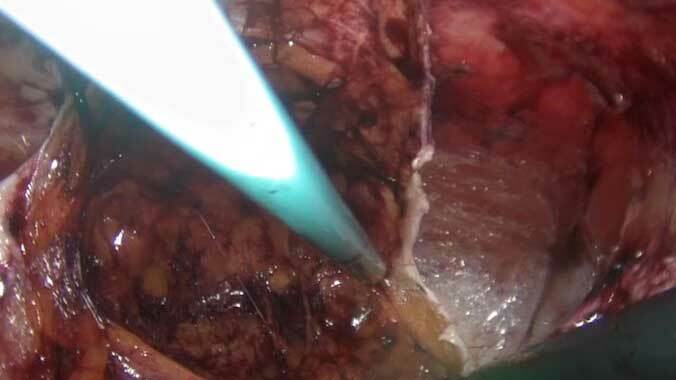 After dissection of an extraperitoneal space with a diameter of about 10 cm and closure of the peritoneum, the procedure can be continued endoscopically after gas insufflation as with a totally extraperitoneal inguinal hernia repair. The trocars are ideally placed through the hernia after closure or sealing of the wounds. Endoscopy can also be performed with single ports. The entire extraperitoneal rectus compartment can be exposed from the retroxiphoid to the retropubic region under protection of blood vessels and nerves. If necessary, a diastasis of the rectus is closed with endoscopic assistance and without extending the incision. The posterior layer of the rectus sheath usually remains open with a completely closed midline peritoneum. 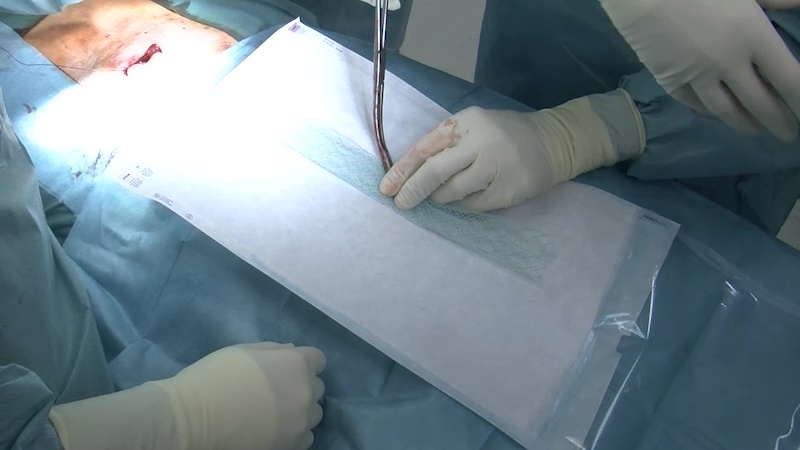 After changing gloves, re-disinfection of the skin and rinsing of the wound with gentamicin in Ringer’s solution, a large pore standard plastic mesh is inserted without skin contact into the extraperitoneal space as a double roll and then unfolded with endoscopic assistance. The plastic mesh should pad the area around the hernia defect by at least 5 cm. The implantation of very large meshes is possible. After securing haemostasis, a Charrière 8 redivac drain is inserted between the abdominal wall and plastic mesh. This is followed by closure of the hernia defect over the plastic mesh under minimal tension as appropriate for the anatomical situation. Fixation of the plastic mesh is only necessary if the hernia defect cannot be completely closed and there is bridging of the hernia defect. Lateral abdominal wall hernias and posterior component separation are also suitable for the MILOS technique. After endoscopic assisted posterior component separation, extraperitoneal dissection of the rectus compartment can be extended into the lateral compartment.